The American President may be powerful, but he isn't happy. He'd much rather be singing. He wants to be better than the best - and he flies around the world to prove it. But can he succeed at achieving his dream job? 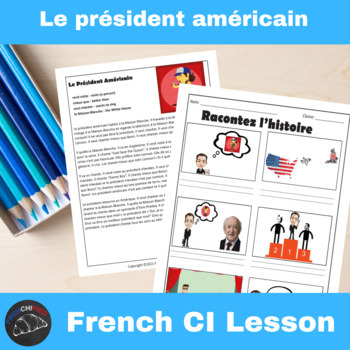 Find out in this Comprehensible Input video lesson for French learners. The story is told in two different ways. There is a printable text version, and an animated mp4 version. Tell the story as you watch it (pause if you want to stop and discuss or storyask! ), or just watch it for comprehension. The video is about 9 minutes long, with pause time for students to read the text. 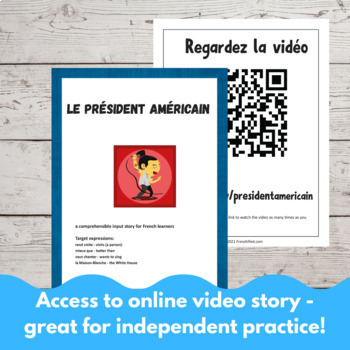 There is a second version of the video with only the illustrations - no text - so you can watch it and do story retells. 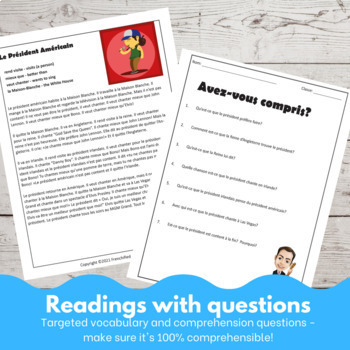 To accompany the video and printed story, there are several activity pages - a comprehension worksheets, a "who said it?" 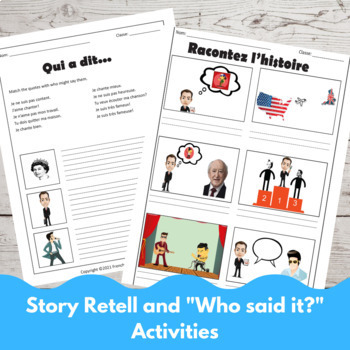 worksheet, and a story retell page. Answer key included.